The HXR-IFR5 interface unit allows the Full-HD Super Slow Motion NEX-FS700 camcorder to capture stunning 4K/2K RAW movie footage with the AXS-R5 RAW recorder. 2K and 4K RAW files shot with the FS700 can take advantage of the trail blazed by the RAW workflow of Sony’s PMW-F55/F5 CineAlta cameras. RAW files created by the NEX-FS700R/RH (FS700RAW Files) are sent to the HXR-IFR5 interface unit which docks to the AXS-R5 RAW recorder. 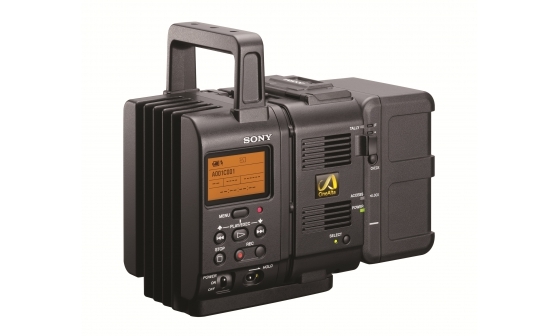 The AXS-R5 recorder is part of the AXSM Access Memory System, which also includes the AXS-512S24 memory card and an affordable USB 3.0 reader, the AXS-CR1. Once on a fast HDD, FS700RAW files can be screened and converted using Sony’s free RAW Viewer software. The AXS-R5*, once docked with the HXR-IFR5, becomes an external RAW recorder for the NEX-FS700R* - enabling an even wider variety of creative shooting styles. Connection with the NEX-FS700R uses just a single 3G HD-SDI cable and the NEX-FS700R can become a camera head when used separately, or it can be used like a camcorder if the whole assembly is mounted onto a rig. (There is a 1/4 inch screw hole for those kinds of rig solutions.) The HXR-IFR5 uses the power source on the AXS-R5, which can be powered by a BP-FL75 lithium ion battery pack or an external DC 12V power source using the XLR 4 pin power input. * AXS-R5 requires firmware version 1.20 or later and NEX-FS700R needs firmware version 3.00 (service upgrade of NEX-FS700R may be a paid option). Other than 4K (4096 × 2160) recording at 24p/25p/30p/50p/60p, 100fps and 120fps recording in 4K resolution is available for approximately 4 seconds. Also, in 2K (2048 × 1080) recording mode, 240fps/200fps/120fps/100fps high speed continuous recording is available for unlimited time. These high speed recording modes are only possible with the combination of NEX-FS700R, HXR-IFR5 and AXS-R5. * Audio is not recorded in high speed RAW recording modes. The combination of the HXR-IFR5 and the AXS-R5 makes possible recording 16 bit linear RAW files onto an AXS memory card, unlocking the full potential of the 4K imager on the NEX-FS700R so the broad latitude and high colour resolution can be captured in RAW format. Using the AXS-CR1 card reader, recorded RAW files can be easily transferred to a PC. Sony’s “RAW Viewer*” software allows viewing, processing and simple colour grading on files. In addition to high quality movies, high resolution 8.4M still pictures can also be captured. * RAW Viewer Version 1.1 or later is necessary. Even in RAW recording mode*, NEX-FS700R can simultaneously record AVCHD onto the camera’s memory card. Since the recorded AVCHD files will have the same time code as the RAW files, the AVCHD files can be used as proxy files for off-line editing. * AVCHD cannot be recorded in high speed RAW recording mode. * Recording duration is slightly different between RAW and AVCHD recording however time code is synchronized. HDMI/Component/Composite video outputs on the NEX-FS700R and the AUX OUT of the AXS-R5 can be used for monitoring purposes. In order to achieve accurate monitoring of the wide dynamic range of RAW recording, Sony has added S-Log2 settings onto the picture profile of the NEX-FS700R (Ver.3.00). * The gamma setting cannot be set individually for each video out/LCD panel/AVCHD recording. * HD output or monitoring on FS700’s LCD are 16:9 mode only. Addition of 2 gamma settings and preset [PP7] on Picture Profile S-Log2 and 709 (800%) gamma. It can apply to SDI/HDMI output and AVCHD recording. Rec control embedded on SDI and HDMI for operating external recorder. Support the secure access mode of Mirroring Memory Stick (PX series). Power zoom (SELP18200) lens supported for using the zoom lever on the grip of the camcorder.